We have completely renovated our romantic cottage in October 2017 and furnished it with great attention to detail. From the outside, the house looks like a traditional, old Hungarian house, inside it hides modern and friendly furnishings. Bright tones and comfortable furniture make for a great feel-good ambience. 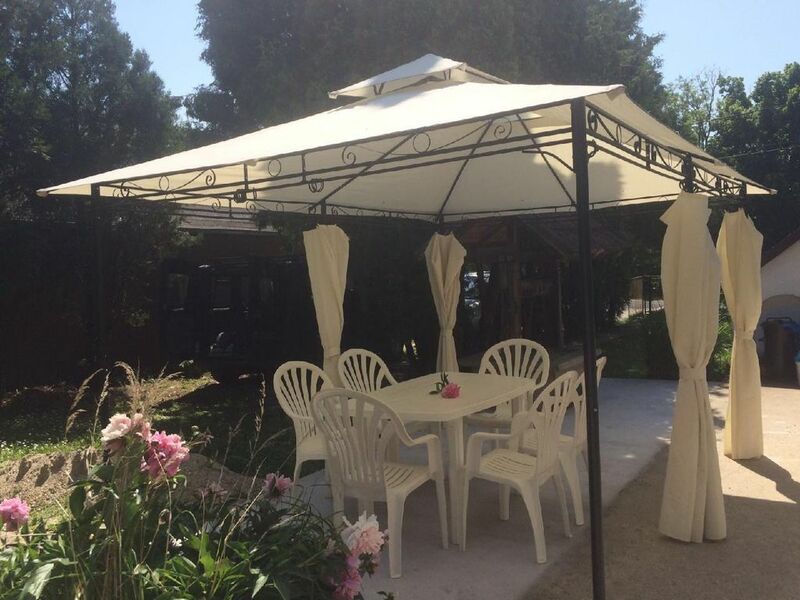 In a small, quiet village (Szólád) just before the vineyards, you are guaranteed away from the hustle and bustle and yet in 8 minutes by car on the beach in Balatonszarszó. The fenced plot with the spacious garden (about 200m ²), lawn, flowers and trees invites you to linger. In the pavilion you can enjoy the quiet evening atmosphere with a glass of wine. Distance to the free beach in Balatonszárszó about 5. 500 meters, pastry shop in the village about 400 meters, grocery store about 500 meters, restaurant about 500 meters. Horseback riding, carriage rides, traditional Hungarian dinner with wine tasting and kettle goulash can be enjoyed 2 km away in Nagycsepely. Hunters can arrange appointments for various types of hunting in the surrounding forests. Kitchen fully equipped with microwave, coffee maker, toaster, kettle, pots, pans, cutlery, crockery, kitchen towels, cleaning products etc. Pet: once per object Costs of 20 EUR (compulsory). Electricity: per object and day costs of 2 EUR (obligatory). Water: per person and day costs of 2 EUR (compulsory).